Dr. Laura Devaney from the Department of Geography, School of Natural Sciences has been awarded the first ever Doctoral Research Award by the Geographical Society of Ireland for her PhD research on food risk governance in Ireland. With stiff competition from top PhD graduates from universities across Ireland, Laura was one of seven shortlisted researchers to present their work at a special session at the Conference of Irish Geographers held in University College Dublin from the 8th-10th May 2014. Laura was selected as the winner by an international judging panel of 5 academics, including Prof. Mike Raco the keynote speaker for the conference from University College London. 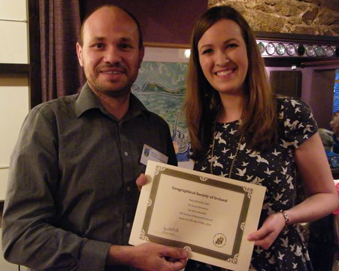 Prof. Raco presented Laura with her prize and certificate at the Conference dinner on the 9th May. Laura conducted her PhD research in the Department of Geography, Trinity College Dublin under the supervision of Prof. Anna Davies. She is currently working as a postdoc in Geography on the CONSENSUS research project.